On Saturday we took the kids to the Sweet Berry Farm pumpkin patch in Marble Falls, about an hour outside of Austin. 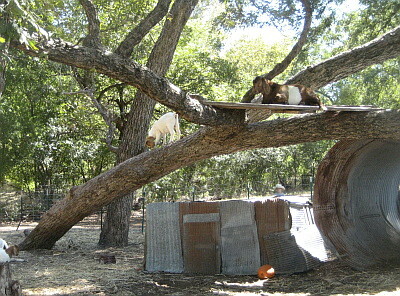 When we checked out the petting zoo we were quite surprised to find the goats hanging out in the trees. 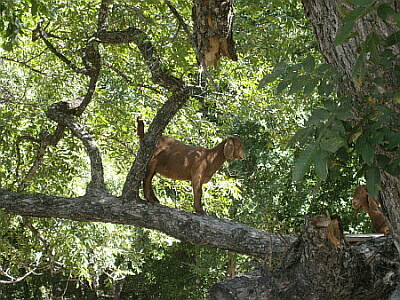 I thought I’d share this rare glimpse of the species goatis-tree-dwellis. This guy even has his own tree house. This entry was posted on Monday, October 20th, 2008 at 11:11 am and is filed under Uncategorized. You can follow any responses to this entry through the RSS 2.0 feed. You can leave a response, or trackback from your own site.